Mai Sheri Cosplay poses at the Cosplay for a Cure photo booth as a character from the Saga series. What started as a tribute to a deceased friend has turned into a popular staple at local cosplay conventions. In just three years, Cosplay for a Cure has raised more than $10,000 for the Canadian Breast Cancer Foundation. Created in July 2012 by Casey Brown, 38, and Gina Greco, 25, the charity was inspired by their late friend, Shannon Neprilly. “We were headed to Niagara Falls Comic Con when she told us she was diagnosed with Stage 3 breast cancer . . . after she told me I realized what to do,” said Brown. Brown connected with Greco and the two gathered friends to start the group. 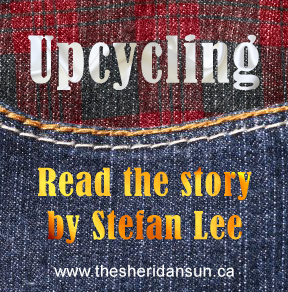 Once they were approved by the Canadian Breast Cancer Foundation, they proposed the idea to local conventions. Con Bravo, a Hamilton animé and sci-fi convention, was the first to say yes. The group survives off a grant they received from deviantART, an art-based website, and their personal finances. The group generally receives two to four tickets from an event for their volunteers. “All transportation, tickets, hotels and the like come from our individual pockets,” said Brown. 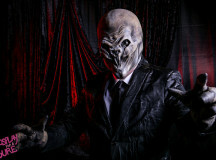 The photo booth style table they have at conventions began as an opportunity for people to take photos with cosplayers – people who dress up as their favourite characters – but has now developed into a very different beast. Anyone at the convention can get a professional photo taken for $2, whether they are in costume or not. For a $10 donation, people receive an entire photo shoot on a CD. Proceeds have grown since the addition of the full photo shoot, and Greco said most of the $10,477 they’ve raised came in the last 18 months. 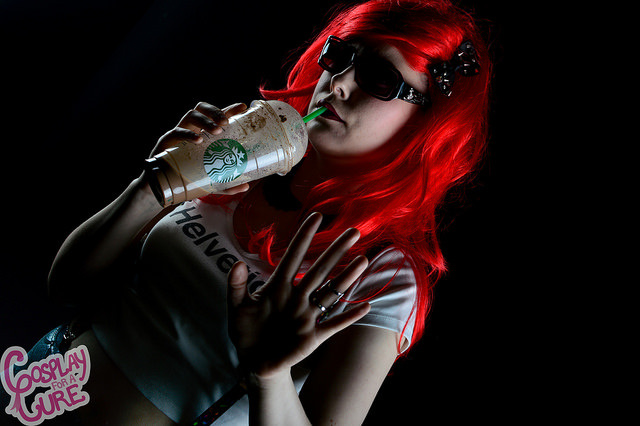 Greco also credits the mainstream popularity that cosplay has received over the years. Visitors to their table at the convention vary from first-time cosplayers, regular convention attendees and a group Brown fondly refers to as the “dollar store warriors”, people who have shown up for photos on several occasions in costumes they made from stuff found from a local discount store. 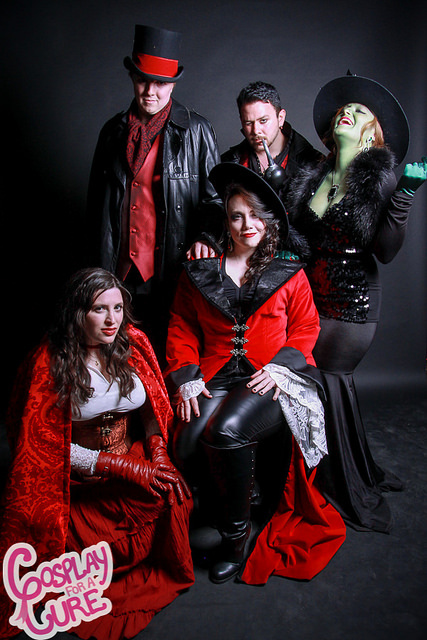 Amanda Irwin of Elemental Photography is an active member of Cosplay for a Cure and works hard to bring an element of self-love to the group’s photo booth. The Cosplay for a Cure team gathered at Con Bravo 2012 for their first event, raising money for the Canadian Breast Cancer Foundation. Irwin offers her experience to the group as a volunteer, providing people with a positive experience with a professional. The group aims to make everyone feel welcome, something that Neprilly strived to do as a cosplayer. “[Shannon] was one of those people that if she knew your character she fan girl-ed. She didn’t care if it was store-bought, or a thousand dollar hand-made costume. 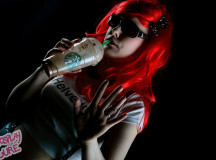 She felt strongly that cosplay was all about fun,” said Brown. 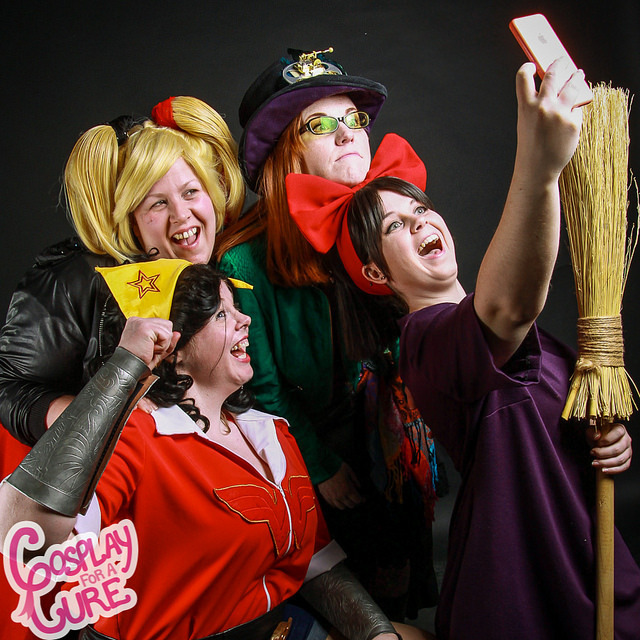 Cosplay for a Cure works to offer a safe space for all people who come by, trying to create comfortable conversation with all who visit and added a “cosplay recovery lounge” last July. In their third year at Hamilton’s Con Bravo, they were allocated a room to provide the usual photo shoots for attendees as well as a place for cosplayers to rest, fix their costumes and be comfortable. While donations have made a massive difference to the group, the biggest impact has resonated with them personally. Neprilly lost her battle with cancer in March 2014 at age 31 and it shook the team. They now raise money in her memory. “We’re remembering a friend and we do it in good spirits. It’s a little emotional for all of us sometimes, but I feel awesome about it being something we decided to do that’s still going,” said Greco. Cosplay for a Cure can be found on Facebook, Twitter and Instagram. 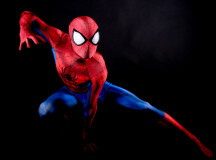 Would you get your photo taken at the Cosplay for a Cure booth? I will! Sounds like a great way to donate! Maybe, if I happened to see it at a convention. I wouldn’t get my photo taken, but I would donate. Heck no, that sounds weird! 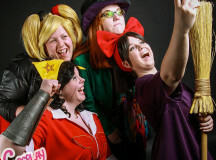 The Cosplay for a Cure photo booth started at Con Bravo 2012 with a team of eight working together to take photos with con-goers. Here, the team poses in front of their first backdrop at their first event. Photography by Elemental Photography. Anyone can dress however they'd like and get their photos taken at Cosplay for a Cure, like this con-goer at Anime North 2014. Photo by Rebel Shotz Photography. 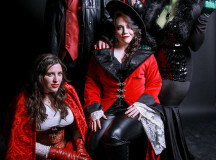 This Once Upon a Time cosplay ground is one of many who are welcome to pose at Cosplay for a Cure for a donation of $2 for a photo and $10 for a photoshoot. Photography by Elemental Photography. 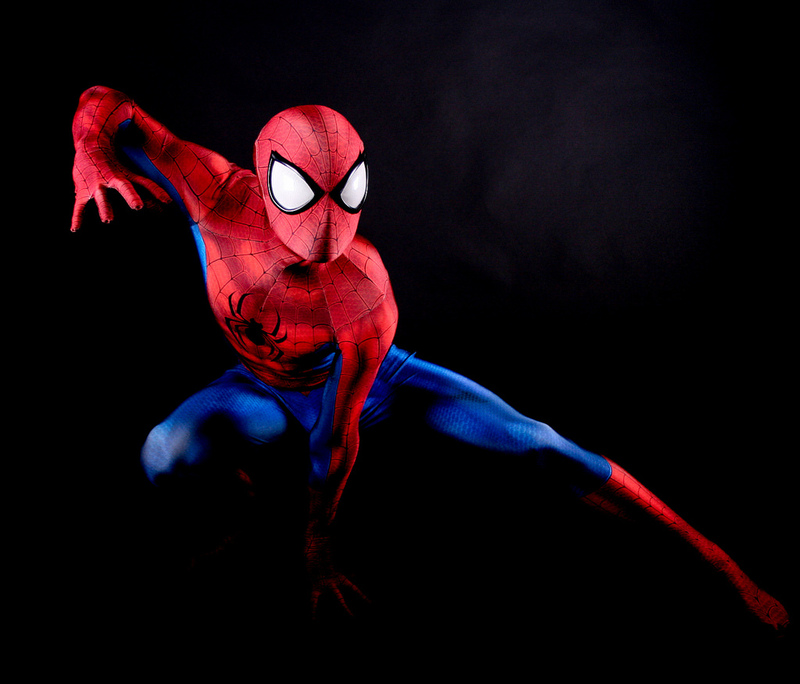 Cosplay for a Cure offers dynamic and interesting photography for cosplayers and people who have had little experience in front of a camera. They strive to create the best photo for you to thank you for your donation. Photography by Skyleaf Creations. 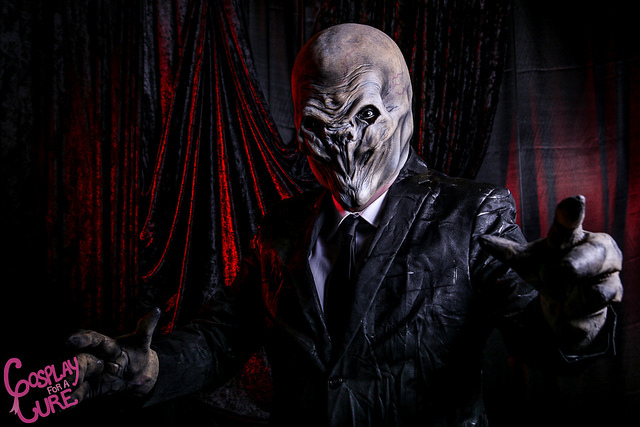 Cosplayers of multitudes of skill-levels get professional photos taken at the Cosplay for a Cure photo booth, like this cosplayer dressed as the Silence from Doctor Who at Con Bravo 2015. Photography by Elemental Photography. Cosplayers of every skill are welcome to pose with friends in their photos, like these Splatoon cosplayers at Anime North 2015. Photography by Elemental Photography. 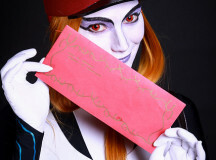 Even original creations are welcome at the photo booth, like this design of a Postal Twili-form Midna created by Mai Sheri Costumes. Photography by Elemental Photography. Founds Casey Brown and Gina Greco pose with cosplayers at Anime North 2015. People can pose in whatever way they'd like at the photo booth, giving opportunities for everyone to relax and have fun. Photography by Elemental Photography. Added by Cait Carter on December 1, 2015.